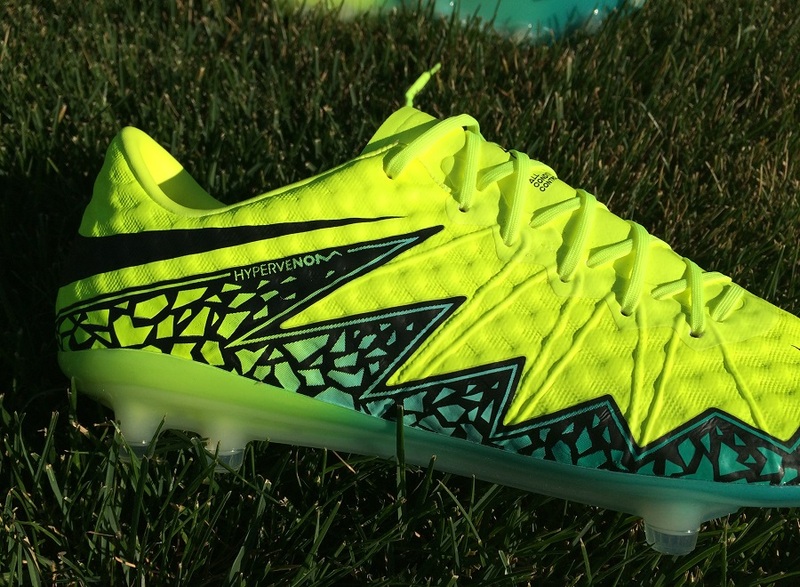 How many of you took a double look when you first saw the new Hypervenom Phinish II? Built in the same fashion as the original Hypervenom release, it seems that Nike took on player feedback and reinstated one of the most popular uppers found on a boot in recent times. It was the resolution to a case of “you don’t know what you’ve got till its gone”. As part of the change-up, or change-back, there has also been some other key modifications to the boot, intended to resolve the issues encountered by the first generation. The question then is how this all comes together, and is this a boot fully upgraded to be a top market player? 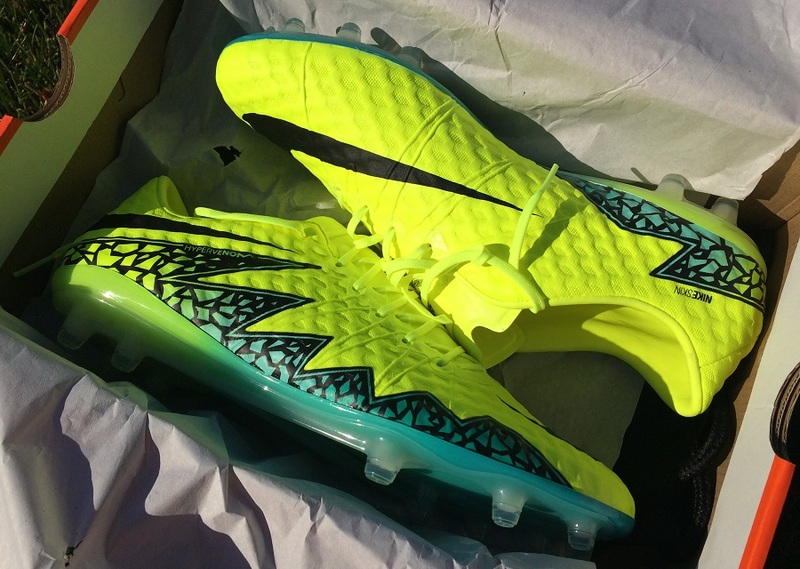 Important to note is that I had the opportunity to test both these and Hypervenom Phantom. A review for the Phantom will come soon, but I purposely chose to review the Phinish first. Why? More on that below. Find the release colorway available at soccer.com. The return of a dimpled and full dimensional NikeSkin 2.0 upper is a huge coup for the Hypervenom series, taking it back to its original roots. Definitely impressed to see Nike listen to player feedback and install something that, in hind-sight, was widely enjoyed by players. The second generation left a lot to be desired and will drift into the abyss with other unremarkable releases like the T90 Laser III and evoSPEED 1.2. This version offers an extra level of excitement and I’m interested to see how they hold up from a durability perspective. This is not the type of boot that you’ll take out of the box, wear and fully embrace right away. There is a short break in period that is needed, primarily because the materials used are synthetic and not naturally soft. You will notice that they are ever so slightly stiff, particularly around the ankle, where the structure of the boot is designed to lock you in. Included as part of this is a built-in tongue that forms across the top of your foot. Laces are in place, but their role is to ensure you have the tight fit required come game time – technically you could wear them with no laces. Flywire is also used through the upper, running in a zig-zag pattern up and down from soleplate to lacing eyelets. Its purpose is to enhance the fit and provide players with a locked in feel. With that in mind, you can start to tell that these are a constrictive style boot starting out, and I could see some players encountering discomfort during the first wear or two. They are tight throughout and the materials are a little more rigid than natural leathers and softer synthetics. Through testing, I thoroughly enjoyed the boots and once they loosened up, they were top class. It is a case where you might need to see out the first game before reaping the benefits. But the end reward is definitely worth it! Why did I decide to review the Phinish first over the high-tier Phantom? There are 2 reasons. First, I’m being selfish and going with the boot style that I prefer first. I see a reason why players would want to wear a boot with a mid-cut collar, but the regular cut is my preferred option. I’ve found collars restrict my ankle from natural movement through tight cuts and chops. Second, I’ve a feeling a lot more of you will turn to the Phinish first, because they mimic the original Hypervenom and provide a much safer value for money option. 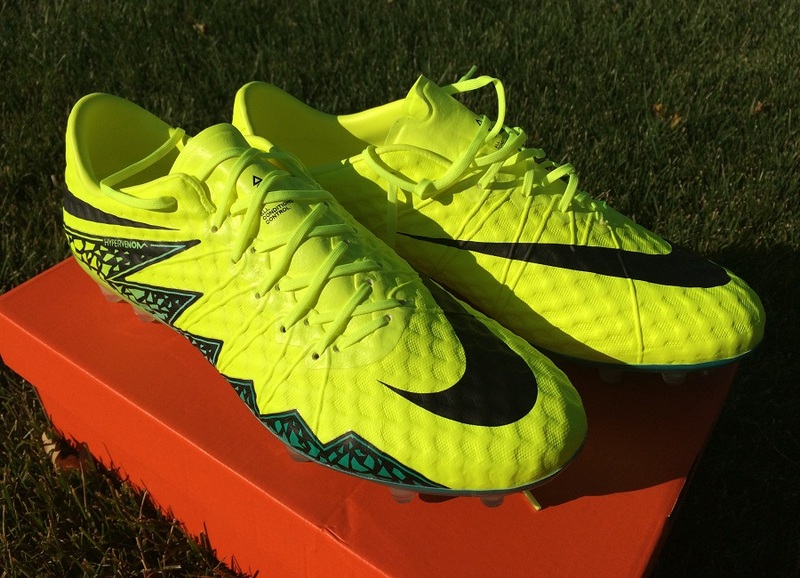 In terms of a comparison, the Hypervenom series is not like other silos like, for example, Vapor vs Superfly. In that case, the level of performance is wildly different between both boots, but with Hypervenom things are much more aligned. It is the dynamic mid-cut collar and the style of tongue (or no tongue) that provides the most significant difference between Phinish vs Phantom. Outside of that, things run very similarly, including feel and touch on the ball. When it happened, fans really didn’t realize what the modification from the original Hypervenom to second generation really meant. 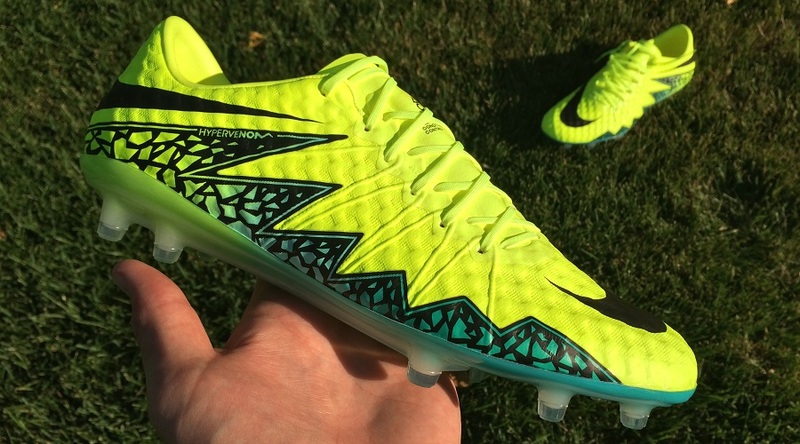 But quickly, that changed as fans began to experience the extra rigid nature of Hypervenom II. Thankfully, Nike reacted to fan requests and worked to reintegrate the honeycomb style textured upper onto this third version. To date, the reaction to the current style has been extremely popular and the performance is as positive as you’d expect. In my circles right now, these boots have become known as the “shovel” boots. Why? Well the first thing to note here is that statement is very much meant in a positive light. We are talking shovel as in “the perfect surface for connecting with the ball”. Off centered lacing with the nature of the upper material works together to provide an extremely sweet strike zone, definitely one of the best currently on the market. The honeycomb texture design is perfect for reducing the amount of impact as you strike shots, while allowing additional flex to increase the surface area between your foot and the ball. In turn, this plays a role in improving accuracy, as you are basically connecting with a more uniform region. Again, I’d definitely classify these as some of the best shooting boots currently on the market, and one of the most impressive to hit the market since the T90 Laser IV. When it comes to dribbling, the positive impact of that honeycomb textured surface again needs to be highlighted. It provides an ideal surface area for soft touches without decreasing the feel as you move at speed. There is a slight dampening effect, but overall the balance between cushion and natural touch is on a pretty ideal level. What does that mean? 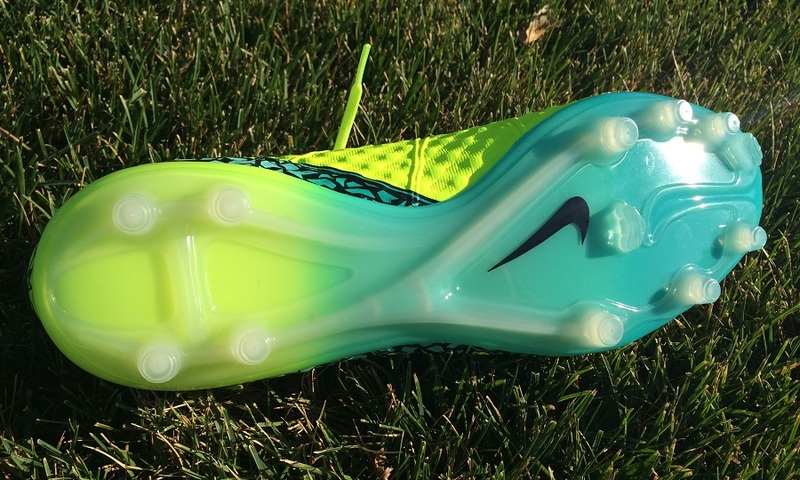 Well, although this is a boot primarily targeted to a playmaker, they have much more to offer. 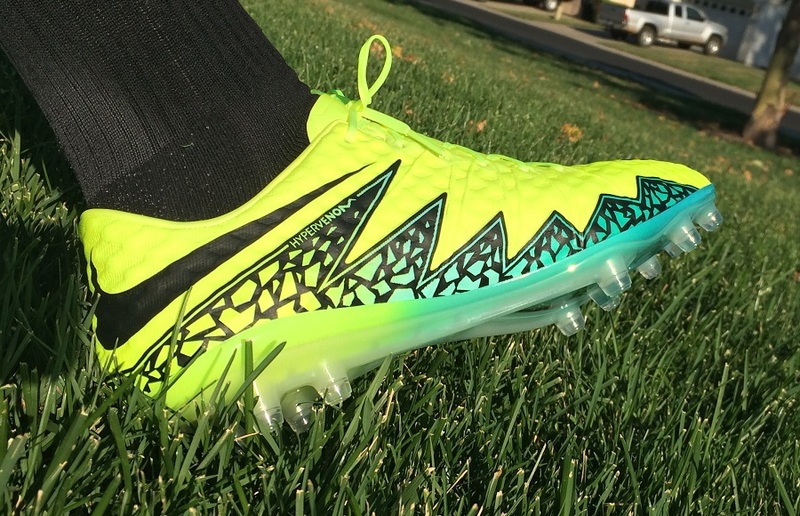 Wingers, who like to move at pace and take on defenders, can be confident in wearing these. A clean, controlled touch is on offer allowing you to focus more on beating an opposing player than where the ball is currently situated. One of the big differences between this version and the original Hypervenom is the introduction of Flywire through the upper. One of the main concerns with the original version was durability, and the addition of Flywire is intended to tackle that issue. In the past, I haven’t been a huge Flywire fan as the role of the wires is to keep structure within the boots without allowing the upper material to stretch. But, in this case its inclusion is absolutely correct and its role very important. Running from the soleplate up through the lacing eyelets, the midfoot region becomes a more secure piece of the boot by ensuring that they are much less likely to overstretch as the amount of tension is reduced. Through testing, the boots have held up tremendously well. I’ve been pretty intentional about keeping them clean and double checking the soleplate/upper to ensure there is no separation. Positive vibes in that department to date! The soleplate on this version of the boot is the exact same as it was on the original Hypervenom, so Nike obviously found value it what it had to offer players. Up toward the front you get six conical studs spread around the outside, with one blade below the big toe and one sitting more centrally. Both are in place to increase surface area and reduce the amount of pressure through the foot. Below the heel, four conical studs are in play. The one other cool feature is the split toe design, there is some flex just below the big-toe. Its role is to allow a little extra movement through the toes, increasing your flexibility and allowing you to turn more naturally. In other words, allow you to be more agile. To be honest, it is not a feature I’ve noticed too much or had a lot of personal experience with. In general, I’m a fan of the soleplate and what it has on offer. I can totally see how Nike would be so comfortable with re-issuing it on the current version of the boot. 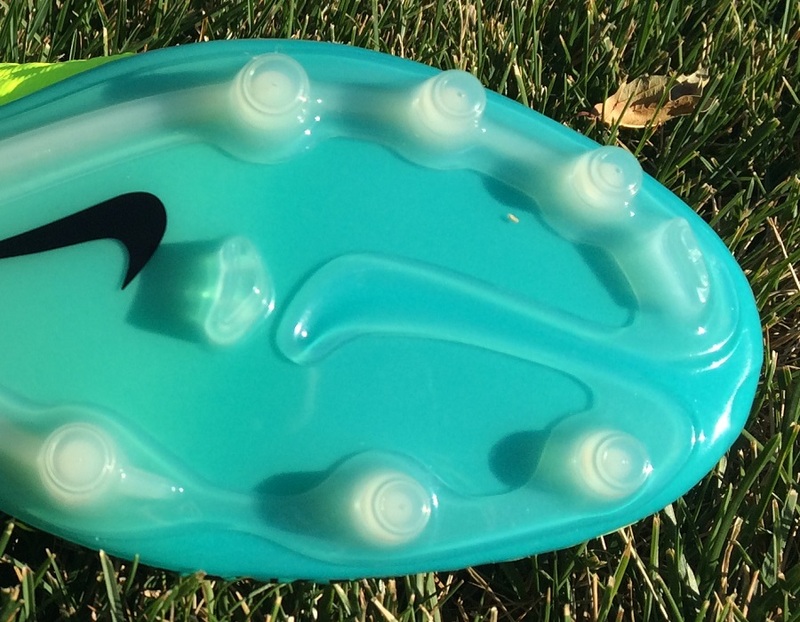 In terms of field type, this is a boot that is ideal for summer soccer, whether you play on natural FG or on an AG. Both provide the right conditions for solid traction and the ability to turn sharply in comfort. The studs have a pretty low profile compared to some other versions currently on the market, so they allow you to cut and chop on a dime, penetrating and releasing from the surface at speed. Where I wouldn’t want to wear them is one a wet field, or right after a big rain storm. 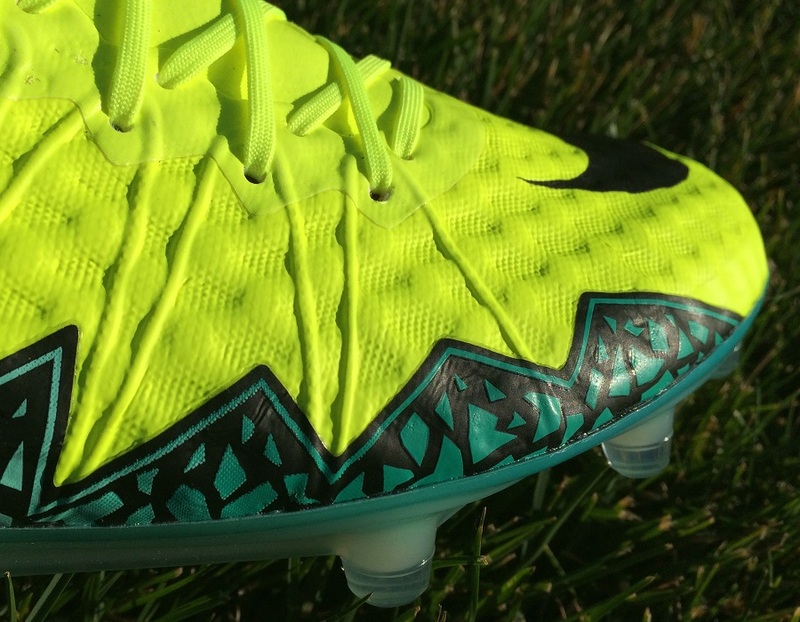 As the surface loosens up, I see the effectiveness of the Hypervenom soleplate decreasing. Compared to the market, this is one of the most accommodating fits you will find right now. It seems that the T90 Laser into Hypervenom series has kept that wide fitting forefoot that a section of the market truly need. Because of the design and lack of stitching, the forefoot has the ability to easily mimic your foot shape through wear. Striking the ball, the material easily folds and you are left with a shovel style upper that provides a wide surface area for connecting with the ball. I’m over-exaggerating here a little, but you get my point. Of course, the one thing you need to remember is that the opening is slightly tight since the tongue is built-in. My tip with this one is to turn the boot sideways as you slide your foot in. If you try it a few times, you will find the right angle and that makes them a lot easier to slip on. So, in general, you can definitely add these to the wider fitting boot options currently available, sitting somewhere close to the top of the list! To be honest, when I slipped these on for the first time they felt tight, and that made me nervous about testing them. I played it same and switched out of them early on when I did break them out, but I persevered through the second wear and that played a vital role in breaking them in. Be prepared for that, take your time wearing them in, and you will be just fine! I’m not sure there is a great deal that can be done to improve this without altering the intended style of the boot, so this is less critical and more of a heads-up observation on what to expect. Outside of that, I’m impressed with these boots and I’m pleased Nike made the correct redirect with the overall design. 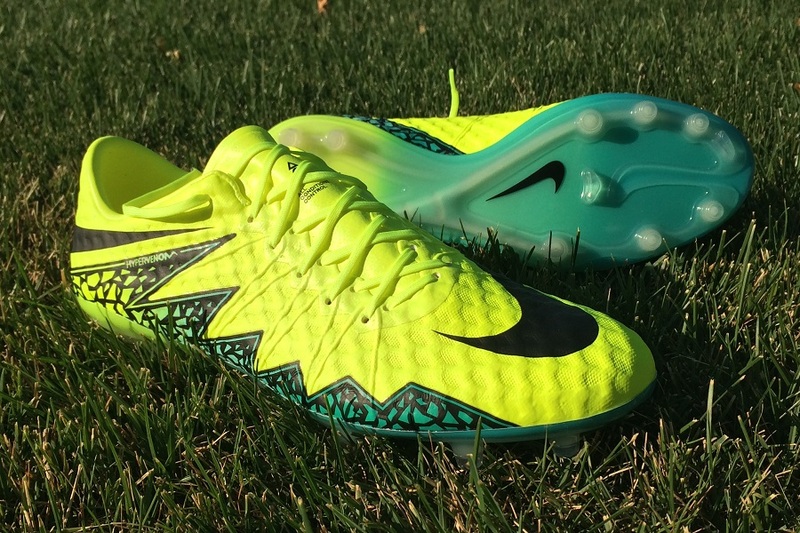 Again, the Hypervenom Phinish II is currently available and can be found at soccer.com. Highlight: Return to a more original style Hypervenom, with that honeycomb texture upper and off centered lacing providing one of the best strike zones you will currently find on a boot. 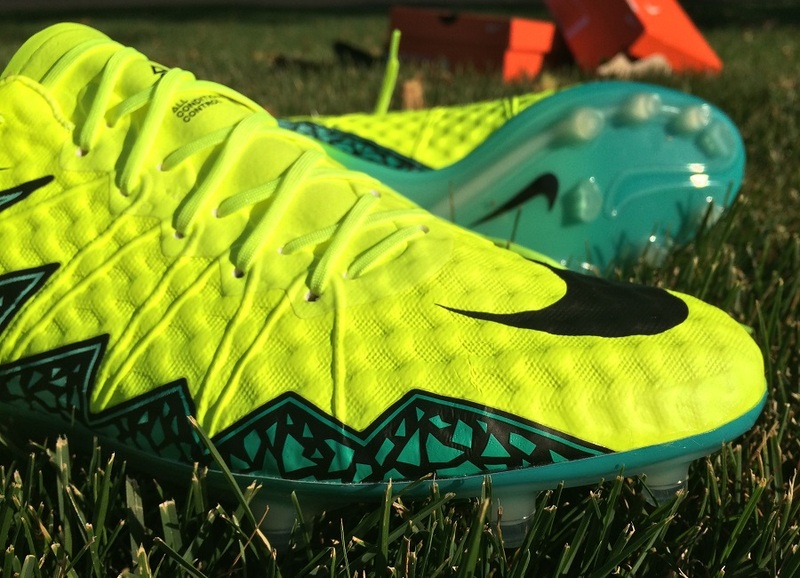 Category: When Nike talk about these boots, the word “Agility” pops up a lot! Would I Buy Them: Yes, I thoroughly enjoyed the performance and I’ve no doubt they will be a top seller through this summer and into fall seasons! Player Positions: Geared toward agility focused playmakers, they have a hybrid feel about them, allowing pacey wingers and hard-working outside backs the ability to wear them with confidence. Nice review but this boot run true to size? In length, definitely. They are wider fitting than other Nike models though, so that is worth noting. Are you feeling the pressure along the side of the toes or under? so i ordered them online and just wearing them around my house the first lace hole is rubbing against the knuckle part of my foot (where most players strike the ball) the pressure marks havent subsided and this is really bothering me. wondering if this is just me or have other ppl experienced this and if so should i return them or try to break them in? Hey Austin, I would return them. There are sure to be better options out there to ensure you don't blister. Try a pair of adidas Gloro if you have the opportunity! How would you compare the Phinish 2 pro to the Phantom 1 pro? Would there be much difference between both SG models? Thanks.